Both my daughter & I love desserts; desserts fill us with glee! She loves Kheer (Indian dessert- sweet Pudding) & Custard also like me! One day, I had an idea- a dish that would be a happy combination! 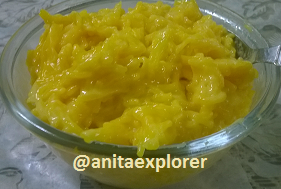 I added Mango Custard powder to my Vermicelli Kheer preparation! My family loved my innovative Mango Vermicelli Kheer dish! Now this dish appears often on our dining-table as per majority's wish! On popular demand, here's the recipe! 4. Serve warm or else, serve chilled. Both taste great! 1. You may increase the Milk/Water in case you wish thinner consistency. 2. Similarly, for thicker Kheer, add extra Custard powder and/or Vermicelli. 3. Change the flavour of the Custard-Powder and have a different flavored & colored Kheer! For example, adding Vanilla or Strawberry Custard powder, will give you that particular flavored Kheer! 4. You may use Rice in place of Vermicelli. In that case, use 50 grams Basmati or aromatic rice. Boiling rice will take extra time. 5. Add extra Sugar in case you want it sweeter! Thanks to Hyatt Hotel #CookWithHyatt, and my friends- Shilpa & Gitanjali for their interest about my recipe! How did you like my recipe? Do try it out and let me know. My recipe has been shortlisted and made it amongst the Top 25 in the Hyatt India Culinary Challenge 2014 #CookWithHyatt. Please do Vote & Comment & support my entry HERE! This sounds delicious! And simple too! Thanks for sharing the recipe. I have such a sweet tooth too! Do hope you'll like the recipe when you try it. On popular demand!!! !A good combination indeed to get vermicelli kheer with mango flavour! Thanks for your appreciation :) Do try it out! Mango vermicelli..Now this is seriously something new!!! Rose/Strawberry flavor & color is a good choice too ! the recipe sounds good,although i am a lazy cook ,would love to create one of these and eat it! YUM!! Sure Nima! Go ahead, prepare & eat :) Pretty simple actually! Notes taken... Sounds really yumm,..